Chicago Tower was established in 1900 to control the interlocking where the Northwestern Elevated's four-track main line narrowed to two tracks just north of Chicago Avenue (technically, at Institute Place). 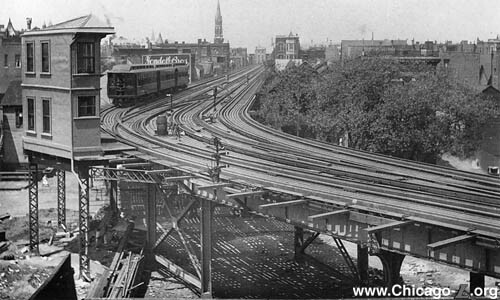 The tower was located on the west side of the elevated structure at the bend in the north half of the S-curve that took the line from private property onto Franklin Street, just north of Chicago station. Because the four-track main line allowed a high level of service north of Chicago but narrowed to just two tracks for the entry into downtown, Chicago Tower represented a choke point on the North Side "L" for many years. This problem was exasperated as the years went on as new branches and extensions to Ravenswood and Evanston and the addition of North Shore Line interurban trains added to the number of trains being funneled from four tracks to two at Chicago Tower. The opening of the State Street Subway in 1943 channeled a lot of trains off the Loop, providing some relief for the North Side Main Line. After the CTA's North-South service revision, effective August 1, 1949, only Ravenswood and North Shore Line trains were regularly using the North Side Main Line between the Loop and Armitage, with Evanston Express trains added during weekday rush hours. With far fewer trains using this section of track, the hours of attended operation at Chicago Tower were reduced on April 9, 1954 to 0645 to 1015 hours and 1400 to 1845 hours weekdays only. At all other times, all trains used Tracks #2 & #3 between Armitage to Chicago towers. Eventually, it was felt that there were few enough trains even during rush periods to confine them to one track in each direction, thus removing the need to staff Chicago Tower to sort trains out where the right-of-way changed from two to four tracks. On June 26, 1961, Chicago Tower was removed from service. The switches were converted to hand-throw. All four tracks north of Chicago were kept serviceable for a time, although only two at a time were used. When, on occasion, the track being used in each direction was changed to allow maintenance on the other, the switches were manually aligned. 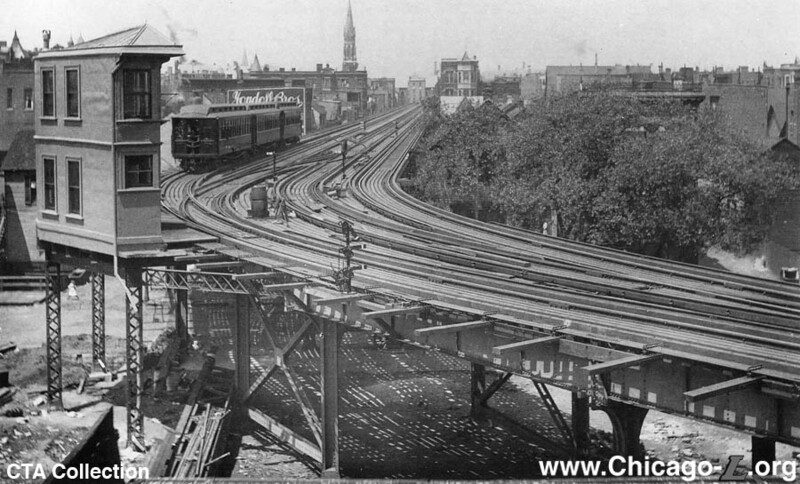 Finally, on October 18, 1976, Tracks #1 and #4 between Armitage and Chicago were removed from service.